San Miguel, CA (August 2, 2017)-Grade One winning Tom’s Tribute has moved to Rancho San Miguel for his third breeding season. Winner of the Grade One Eddie Read in a stellar career that saw him win six of sixteen starts and $634,880 under the tutelage of James M. Cassidy. Tom’s Tribute, under the ownership of DP Racing, will join the Rancho San Miguel stallion roster for a fee of $2,000 Live Foal. 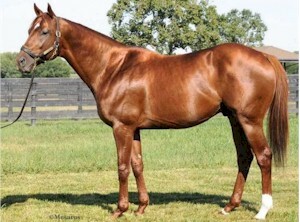 Tom’s Tribute, a 2010 son of Lion Heart out of Halloween Fun by El Prado, was a $310,000 Ocala juvenile sale graduate that won or placed in seven stakes from 2 to 4; before an untimely fetlock injury while preparing for his five-year-old campaign. Winner of his second lifetime start, Tom’s Tribute was off the board only once as a three-year-old and only twice as a four-year-old. During his four-year-old campaign Tom’s Tribute came roaring down the stretch to win the Thunder Road Stakes at Santa Anita Park equaling the course record set by Wise Dan for a mile on turf in 1:31.78. As an up and coming son of the successful sire of sires Lion Heart, Tom’s Tribute will be following such prominent sires as Kantharos and Line of David.